I deep-dive into the 6 agile methodologies commonly used by project teams in 2019. It’s Agile week at Productivity Land. Steve decided to explore agile project management and come up with a beginner’s guide for his blog post earlier. Therefore, I decided to go more in depth and build a more comprehensive guide on agile methodologies. I wanted this to be a one-stop learning guide for everything related to agile methodologies, their core values, principles, roles and responsibilities, and more. Agile methodologies comprise a variety of frameworks that focus on a broad range of project management chambers – streamlining collaboration through Kanban, simplifying complex projects through SCRUM and improving software quality by employing Extreme Programming. Each agile methodology functions on the 12 main principles concocted by the Agile Manifesto, with technical disparities in their characteristics, features and the model on which they function. Created and first conceived of by Jeff Sutherland and Ken Schwaber, Scrum is a lightweight process framework that utilizes and applies agile project management in its most rudimentary form, that is, Scrum focuses on breaking down complex software development into small iterations called Sprints. What are Sprints in Scrum Project Management? A Sprint is a time-boxed period that lasts between two to four weeks. Each Sprint is marked with milestones that are the team’s top priority which they work to achieve. These milestones are an effort to release a working, error-free product at the end of the cycle. A Product Backlog is most commonly understood as a defined list of items, values, and requirements that are needed to be added or improvised to the product under development. A Product Backlog is continuously revised and updated in parallel to the project life cycle. As the product grows and enters a new stage of development, the requirements, improvisations, and priorities grow with it. This entails regular additions, and changes to be made to the product backlog. 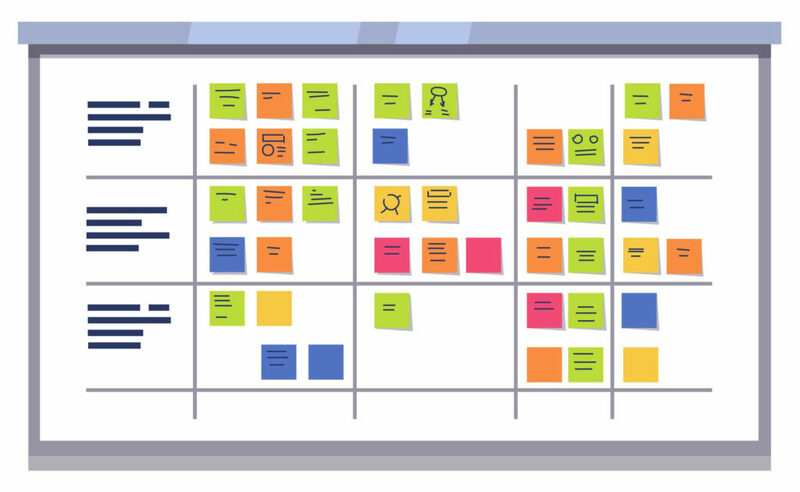 The product backlog provides the Agile project management team insight into what are the key essentials that the product needs to be competitive, useful and satisfactory in the eyes of the users. A Sprint Backlog is the set of product backlog needed to for a specific Sprint in question. Its main purpose is to demonstrate what the goal of the Sprint is, what needs to be achieved and incremented during those 2-4 weeks of a Sprint. The duration of the sprint backlog lasts until the Sprint itself comes to an end. The Team working on the Sprint, continuously updates the backlog in accordance with the progress being made during the sprint. The team enlists the number of items from the Product Backlog, that it will complete or has completed in the sprint and adds it to the Sprint Backlog. The product achieved at the end of each Sprint is called an increment. As each Sprint aims on delivering the product in an incremental value, the increment should be a working, usable solution gathered at the end of the Sprint cycle, and should be ‘Done’. An increment comprises of all the priority checklist items present in a Sprint Backlog. Product Owners are keepers of the product under development. It is their job to understand the market and business value of the product to ensure the right kind of metrics and requirements are being followed. The Scrum Master acts as the coach that helps the Product Owner and the team to understand the value and techniques involved in the Scrum Project Management process. It helps streamline the workflow to align within the guidelines of Agile Project Management. In many ways, the role of the Scrum Master is the backbone of the project. The Scrum Master works to deeply understand the nature of work being done by the team, and what is required to get the job done successfully. The Scrum Master is the only role in the Scrum framework that wears multiple hats and has its feet dipped in more than one aspect of the project. The development team consists of various departments – developers, engineers, testers, etc. The Scrum development team is self-organizing, cross functioning and works collaboratively to help each other in bringing each increment to the ‘Done’ state. The Scrum development team must share their work with each other with each Sprint to keep each other updated and informed about the progress. The Scrum framework works on a set of prescribed and regulated events. Each event itself is timeboxed much like the Sprints in which the entire product development is carried out. Each event in the Scrum life cycle relies on the success status of the objective for the stage. The Sprint Planning is the first stage that takes place before the start of the project. In this stage, the product owner devises a product backlog and enlists the top priority items that need to be implemented first and foremost. Whereas, the team plans in what way each of these checklist items will be implemented, what deadline to give and what measures to take for executing them proficiently. It is during the Sprint Planning that the goal of the Sprint is also decided to centerline the objective. Once the Sprint Planning session has taken place and the work on the Sprint Increment has commenced, the development team meets for daily meetups called Scrums. These are short meetings of <15 minutes in which the development team assembles to share their progress, concerns, issues and feedbacks needed for meeting the Sprint goal. The daily Scrums are in some ways inspection of how the collective work is progressing. It is a self-organizing mechanism that empowers teams to be their own managers and enhance their communication by sharing roadblocks, new solutions and strategies. At the end of the Sprint, the entire Scrum team gathers for a comprehensive demonstration of the increment achieve at the end of the Sprint. The demonstration typically includes stakeholders and clients that assess how useable and market-worthy is the product at this stage of the life cycle. The Product Owner enlightens the stakeholders on what part of the Sprint plan has been ‘Done’. From this point onwards, the team and clients collectively review and brainstorm on what needs to be done next in terms of product release, with relative focus on budget, timeline and resource capabilities available. Like Scrum, Extreme Programming (XP) is another lightweight agile project management methodology, that focuses on adapting change to accommodate client and customer preference. It was created by Kent Beck in 1999 as an incremental approach to software development with the fundamental emphasis on how the code is written and tested. Beck’s fundamental idea that classifies XP as an agile methodology is the teamwork and iterative based system where coding, testing and design are taking place asynchronously as the project develops. Much like Scrum Project Management, there is maximum team collaboration and interaction involved, which however minimizes the need for extensive documentation. Extreme Programming is not simply a methodology operating on a multitude of steps, Kent Beck conceived a group of values to help guide team behavior and understand how to implement Extreme Programming within the paradigm of Agile project management. Simplicity – workload is divided into smaller compartments to allay the complexity. The team focuses on and accomplishes the given portion of the work at a given time only. Effective Communication – Teams work on a collaborative basis, discussing each outcome, drawback, requirements in daily meetings known as standups. Consistent Feedback – Teams center and adapt their workflow around feedbacks and changes coming in from clients or customers. Respect – Each member of the team is acknowledged for their input and amount of effort contribution made. Regardless of a hierarchy, management respects the developing team, and the developing team respects the customer demand. Courage – Teams are encouraged to accept the failures during the project life cycle instead of covering them up with prevarications and lies. The true status of work progress is displayed and shared without any fear of reprimanding accountability. In 1999, Don Wells published the first XP rules to elucidate the main disciplines of software development in Extreme Programming. The rules outline the step-by-step activities that are a part of the working XP model. Customer creates user stories. These are not overly technical or extensive. Implement Collective Code ownership. Any developer can make changes to the code, identify and fix bugs or refractor. Why is it called ‘Extreme’ Programming? The practices involved in this lightweight Agile project management methodology are thrust to an extreme. An XP team is made up of 5 roles besides a manager. It is preferable that each role is designated to separate team members. Kanban is a Japanese word meaning ‘ssignboard. It originated in 1940 by a Japanese engineer Taiichi Ohno working in Toyota Production Systems, to incorporate control over each production phase. Therefore, Kanban is best recognized as a scheduling system, which grants supremacy over production inventory. Kanban confines the amount of unfinished work, enabling businesses and teams to prevent a clutter and chaotic confusion that results in loss of inventory track record. Kanban utilizes the just-in-time production approach that enables project managers to keep a track of their resources usability. Kanban does not work in a procedural manner starting with a first stage and ending in the last step. It can be implemented on any workflow from anywhere in the project’s life cycle. Kanban can be implemented on a project that is already under progress. Kanban is designed to support incremental change management. Workflow and team collaboration that employ Kanban approach are encouraged to make small evolutionary changes a part of their work process. Unlike other methodologies that prescribe a set rule of roles and framework within which a project has to function, Kanban does not mandate the abolishment of old existing process. Teams can continue to work in their existing roles with the same responsibilities as before Kanban was adopted. This allows harmony to exist between, old working ways that bring value to the business as well as the incremental agile framework of Kanban. The flexible and buoyant model of Kanban allows transparency in the work frame. Since there is no such thing as classified information in Kanban approach, every member of the team is cognizant with the ups and downs of the project that is visually accessible on the Kanban Board. With this mode of power available for grabs to each team member, Kanban encourages leadership authority at all levels. This requires teams to foster a mindset of continual improvement at individual level. For successful implementation of Kanban, David Anderson, identified 6 practice steps of Kanban. Practice steps are not sequential steps that need to be followed one after another, rather these are guidelines on how to make the best use out of Kanban. Kanban excels at illustrating team projects and tasks within the projects for quick and efficient insight into the workflow. One of the chief components of Kanban, as the original meaning of its name implies, is the Kanban Board. The Kanban Board is a visual representation of the workflow at every given stage of a project’s life cycle. The board is compartmentalized into three sections: in-progress, completed and requested. This serves as a real-time inventory that is being continuously updated for any roadblocks, issues and impediments that may be either on-way or a potential threat. Each column or a section on a Kanban Board is made up of Kanban cards, placed inside each column. The card holds information such as the details of the task, their progress, who is it assigned to and its due date. The cards serve as information hubs that are accessible and visible to the entire team. One of the most impressive agile aspect about Kanban is the ability it provides to move cards from one section to another with the help of seamless drag and drop functionality. One of the best uses of Kanban is to limit the WIP (Work In Progress). Tasks (or in this case Cards), are given a maximum limit that can be reached in a stage (which in this case is the column on a Kanban Board). The number of tasks In-Progress cannot outnumber the number of tasks completed or requested. To keep the cards running through the Kanban System from one stage to another, teams must work together to limit the work in progress. Limiting the WIP gives an insight into available resources with no priority tasks at hand, which means those resources can work on completing the pending tasks on an urgent basis. The flow of the work through the Kanban System should be smooth, uninterrupted and free of any blockage. A cascading workflow that transitions from one stage to another in a consistent manner signifies the absence of bottlenecks and roadblocks, and is proof that team performance and work metrics are not only productive but generating business value. Implementing Kanban does not entirely promise success. To gain consistency in meeting deadlines and finishing urgent deliverables, teams need to keep working on their weaknesses and solidifying their strengths. In Kanban, feedback is a vital part of the way teams work. Feedback is obtained and shared between team members and their managers, during daily standup meetings. These meetings ideally take place in the light of the Kanban Board, where each member enlightens the rest of the team on what has been achieved so far and what will they be working on tomorrow. Adaptive Software Development is a framework built on a set of adaptive practices, collaborative principles to help organizations adopt an adaptive process when building large and complex products. In 2000, Jim Highsmith published a book, on Adaptive Software Development. In his book, Highsmith explained that ASD is a modified version of Rapid Software Development. The best practices of ASD emphasize on accommodating change in adaptive, incremental manner, so when unforeseen precarious conditions emerge, teams can evolve and acclimatize to the new dynamics without risking product release and other essentials like resource availability and budget limitations. Adhering by the hallmarks of the Agile framework, ASD supports vigorous communication and interaction between developers, testers, engineers and the team lead. ASD does not instigate on a pre-planned phase or ideology. However, a mission statement, precise and well-defined, guides the team towards the end goal of each iterative cycle. The mission statement does not affect the exploration practices on part of the team to discover new more effective strategies and solutions to build the product. However, it narrows team focus on achieving the result in alignment with the proposed preferences. The ASD approach focuses on tangible results. Does the increment at the end of the iteration contain working features? Does the product release contain customer-demanded functionalities? Development is chunked and fragmented into time boxed iterations, so the product is re-visited, re-tested and improvised from the first stage of the development. Each iteration deliverable is given a due date to ensure on-time delivery of the product version. The workflow keeps any potential risks into account so that the team is prepared to adapt to the change in workflow dynamics due to a problem. Welcomes change at any level of the working team and at any stage of development, mostly for modification and improvement in the practices or the product itself. In ASD, teams must acknowledge the likelihood of uncertainty and unforeseen interruptions, throughout the process, it is for this reason, the word Planning is replaced with speculation. Collaboration in ASD is considered a concurrent feature development. Whether it is a large-scale project or small, teams work concurrently work together on various components of the application and communicate their results and findings with customers and within the team. Alistair Cockburn, one of the co-authors of the Agile Manifesto, presented the collection of Crystal Methodologies starting 2004. He described Crystal as lightweight, adaptive, incremental and people-focused. The Crystal Agile project management methodologies are color coded starting from clarity and ascending to darker nuances. The range of colors signify the complexity of project management required. The larger the project, the darker the Crystal Methodology applicable. Crystal Clear – for short term projects that need a small team of 5-6 people. Crystal Yellow – for projects that rely on not more than 20 people. The most imperative priority of Crystal are the people. Workflow process comes in secondary. It is vital that the human activity which is the real and only source of the software development comes first and the process is modeled on the needs of the team, not the other way around. It emphasizes self-organization and self-management in team members, to formulate an empowered atmosphere where everyone feels competent enough to streamline the workflow on their own. Crystal framework does not imply the use of any one procedure or set of techniques. It gives its users the benefit of incorporating the technique of their selection, whatever suits the business, whatever works for the business. It is for this reason, Crystal is also referred to as the “stretch-to-fit” methodology that encapsulates any methodology within its own framework. In Crystal approach, the focus is foremost on human activity, then secondarily on the process and then least of all to documentation. It limits the requirement of extensive reporting, lengthy documentation and overhead management. Transfer of information is predominantly done through face-to-face interaction between the team members. Fast, incremental delivery of the product that is regularly tested and coded throughout the project’s life cycle. Allows room for constant improvisations that can be made to the product to meet customer expectations. Teams can test new ways and strategies to bring the product to a fully functioning version as per client demand. Osmotic Communication that is attained by the entire team seated in the same room, is a cost-effective means of communication and transfer of information. All discussions take place within the ear-shot of the entire room and enters every ear present in the room via background osmosis. Teams must be able to share and collaborate without any limitations such as difference of opinion, opposing train of thoughts or a difference in leadership. All team members are aware of the tasks assigned to them, the responsibilities entrusted to them, to avoid any misunderstandings and overlapping job role conflicts that may hamper team performance. Crystal enables users to be an active part of the system. It encourages early and regular feedback from users to anchor team work in the right direction. Dynamic Systems Development Method (DSDM) is one of the most outstanding and praiseworthy methods of agile project management. It was created in 1994 as an extension of the Rapid Application Development by a consortium of vendors in United Kingdom in the field of Information Systems (IS). DSDM is different from other agile methods in another aspect, and that is it focuses on product delivery than on team activity. Team cooperation however is just as important in DSDM as in any other Agile methodology. The users should be actively involved in the development of the product to monitor the accuracy of the decisions made before work can be started or improvised. The team must have the autonomy to make ad hoc decisions necessary for the progress and health of the project, there should be minimum hindrance of red tape and from the higher management in the impromptu decisions that the team takes. Product must be released frequently from the early stages. Early and rapid delivery of the product will ensure that the users get to receive a demonstration of the product and give their feedback. Development of the product is carried out in iterations to maximize user feedback and product improvement. The high-level, indispensable scope and requirements of the project must be defined before the development starts, during the Pre-Project phase. The workflow process proceeds with integrated testing at its pivotal center. The product is repeatedly tested during and after every stage of development that it is hurled through. Effective communication and cooperation between all core teams, management and stake holders is essential for the development process. The pre-project phase occurs before the project starts. The management outlines and defines the requirements of the project. The vision along with the concept of the project is materialized to fit the budget which is also finalized. These are sequential steps that take place in the prescribed order. In the feasibility study, the team sits together to assess and find answers to questions such as: will the established ground rules and project plan thrive in producing a working product in time? Will it thrive in the constraints of the appointed budget? Since DSDM is applicable to IS solutions where time is a scanty commodity, the feasibility as well as the business study stage is conducted as quickly as possible. In the business study stage, the management along with its team, speculates and conducts a quick brainstorm survey on the business aspect of the project. What is the user demand? What specifications should be kept in mind to preserve the business value of the project? What technology will be used to fulfill the business quality of the product? What expertise and skills will be needed to test and deploy the product? Once the pre-requisites have been cemented into a solid backbone, the development of the IS can begin. The developing team commences by building functional prototypes. A functional prototype of the product is a preliminary version of the functions that the finishes working model of the product must contain. In the design and build stage, the product is designed. A design model is created that is first coded as per the mission statement and is then tested and reviewed. The design and development of the product takes place in iterations. After the product increment is reviewed and tested, it is pushed into the last stage where it is documented. A review document is also created where the requirements of the product are compared with the point and functionalities achieved. The developers demonstrate a tutorial to users on how to use the completed version and the users provide their feedback. The post-project phase ascertains and verifies that the end version of the product works effectively and efficiently. The team uses DSDM principles of iterative maintenance to ensure the working quality of the product. If there is a need for enhancements or fixes, then the product is sent back into the previous stage for further development. DSDM facilitates projects that do not possess the luxury of vast timeframes and abundant funding. Therefore, it endorses that blocks of work in the development stage should be prioritized to make the best use out of time. Instead of devising milestones on a project roadmap, DSDM applies the use of time boxing. An iterative cycle is formulated – usually between 3-6 weeks – during which an entire checklist of tasks and objectives are completed. Prototyping is the backbone of DSDM. If a team is not making generous use of prototyping as part of the incremental development process, they are not following the DSDM approach. Usability Prototype – Is the user interface free of errors and bugs? Capability Prototype – Is there room for further enhancement of the product? Technical Coordinator – in charge of taking care of the technical aspects of the project. Makes sure everyone understands the technical details and how to execute them. From a more analytical perspective, and to gain a lucid understanding of where each methodology is best applicable, there are a multitude of disparities that must be realized. Thank you so much for that comparison. Very informative article.